More than 24,000 teachers, and nearly 200 governments, school districts, universities, and organizations pledge to expand CS for millions of students worldwide! Alabama — Governor Ivey pledges that the state of Alabama will provide support to enable every public high school to offer at least one computer science course by 2022. This will provide an opportunity for all Alabama students to learn authentic computer science and provide them with the skills necessary for college and careers of the future. Arkansas — Since 2015, when Governor Hutchinson signed the law that requires all high schools to offer course in computer science, enrollment has grown by 620%. The number of girls taking computer science has increased by 1100%. The Governor’s support of that initiative included an allocation of $800,000 for the K-8 Computer Science Teacher Lead program to recruit and train computer science teachers. Today, the Governor announces another $200,000 allocation to the program, which providers teachers a financial incentive to train for this important field. Missouri — Missouri legislators recently took a bold step to support K-12 computer science education by becoming the first state to pass legislation during a special session expanding course opportunities. Governor Parson pledges to continue to build on the foundation passed during special session, joining the Governors’ Partnership for Computer Science and laying the groundwork for providing students with access to qualified teachers, updated technology, and age-appropriate curriculum for every student to have the ability to succeed in the workforce demands of tomorrow. Montana — In his budget proposal for FY20–21, Governor Bullock proposes to prepare the workforce of tomorrow by investing $250,000 in professional development for computer science teachers. By increasing training opportunities for teachers, Montana can ensure that all its students gain the skills they need for the jobs of tomorrow. A+ College Ready — Alabama — pledges that in 2019, they will train 400 K-5 teachers, 70 middle school teachers, 50 AP Computer Science Principles teachers and 20 AP Computer Science A teachers to teach computer science while implementing the Alabama Digital Literacy and Computer Science Standards. They will also train 20 school administrators, and spend $200,000 training public school teachers in Alabama to teach computer science, and provide ongoing support to these teachers. A+ College Ready — Florida — pledges to prepare 50 teachers to teach CS Discoveries and 40 teachers to teach CS Principles in 2019. Accenture — Ireland — is pledging to expand its coding tutorial, Accenture Intelligent Space Exploration, with instructions in 20 additional languages, helping even more students around the world gain a better understanding of artificial intelligence (AI). Alameda County Office of Education — California — pledges to prepare 20 teachers to teach CS Discoveries and 16 teachers to teach CS Principles in 2019. Alaska Staff Development Network — Alaska — pledges to prepare 64 teachers to teach CS Discoveries and 60 teachers to teach CS Principles in 2019. Allegheny Intermediate Unit 3 — Pennsylvania — pledges to prepare 96 teachers to teach CS Discoveries and 96 teachers to teach CS Principles in 2019. BATEC — Massachusetts — pledges to prepare 30 teachers to teach CS Discoveries and 40 teachers to teach CS Principles in 2019. Battelle Education — Ohio — pledges to prepare 48 teachers to teach CS Discoveries and 32 teachers to teach CS Principles in 2019. Broward County Public Schools — Florida — pledges to prepare 30 teachers to teach CS Discoveries and 18 teachers to teach CS Principles in 2019. Center for STEM Education, The University of Texas at Austin — Texas — pledges to prepare 60 teachers to teach CS Discoveries and 48 teachers to teach CS Principles in 2019. CodeMonkey — California — pledges to make accessibility a priority. That’s why they’re releasing an all new narration feature that will read out-loud lines of code. This means that a user can write code and click on a speak icon to check if they wrote their code correctly. The point of this feature is so students who have not yet learned to read, have dyslexia, are slow-readers or are English language learners have an equal chance of learning code as any other student. CodeVA — Virginia — pledges to prepare 80 teachers to teach CS Discoveries and 40 teachers to teach CS Principles in 2019. Contra Costa County Office of Education — California — pledges to prepare 20 teachers to teach CS Discoveries and 15 teachers to teach CS Principles in 2019. Delaware County Intermediate Unit — Pennsylvania — pledges to prepare 64 teachers to teach CS Discoveries and 64 teachers to teach CS Principles in 2019. Educate Maine and Maine Mathematics and Science Alliance — Maine — pledges to prepare 24 teachers to teach CS Discoveries and 24 teachers to teach CS Principles in 2019. Elementary Institute of Science — California — pledges to prepare 25 teachers to teach CS Discoveries and 18 teachers to teach CS Principles in 2019. Explora-Science Center and Children’s Museum — New Mexico — pledges to prepare 25 teachers to teach CS Discoveries and 20 teachers to teach CS Principles in 2019. Florida International University — Florida — pledges to prepare 32 teachers to teach CS Discoveries and 24 teachers to teach CS Principles in 2019. Florida State College Jacksonville — Florida — pledges to prepare 36 teachers to teach CS Discoveries and 30 teachers to teach CS Principles in 2019. Fresno County Superintendent of Schools — California — pledges to prepare 24 teachers to teach CS Discoveries and 24 teachers to teach CS Principles in 2019. George Fox University — Oregon — pledges to prepare 48 teachers to teach CS Discoveries and 30 teachers to teach CS Principles in 2019. Georgia Tech Center for Education Integrating Science, Mathematics, and Computing — Georgia — pledges to prepare 48 teachers to teach CS Discoveries and 48 teachers to teach CS Principles in 2019. Idaho Digital Learning Academy — Idaho — pledges to prepare 32 teachers to teach CS Discoveries and 16 teachers to teach CS Principles in 2019. Illinois Math and Science Academy — Illinois — pledges to prepare 60 teachers to teach CS Discoveries and 60 teachers to teach CS Principles in 2019. Institute for School Partnership Washington University in St. Louis — Missouri — pledges to prepare 24 teachers to teach CS Discoveries and 48 teachers to teach CS Principles in 2019. Kentucky Science and Technology Corporation — Kentucky — pledges to prepare 50 teachers to teach CS Discoveries and 45 teachers to teach CS Principles in 2019. Los Angeles Unified School District — California — pledges to prepare 50 teachers to teach CS Discoveries and 32 teachers to teach CS Principles in 2019. Lumity — Illinois — pledges to prepare 50 teachers to teach CS Discoveries and 30 teachers to teach CS Principles in 2019. Make School — California — is launching a project-based Bachelor’s Degree program in Applied Computer Science where students only pay if they get a job. Financial aid for students in need is available to cover dorm rent and food. Marquette University — Wisconsin — pledges to prepare 80 teachers to teach CS Discoveries and 24 teachers to teach CS Principles in 2019. Maryland Codes — Maryland — pledges to prepare 75 teachers to teach CS Discoveries and 75 teachers to teach CS Principles in 2019. McNeese State University — Louisiana — pledges to prepare 24 teachers to teach CS Discoveries and 24 teachers to teach CS Principles in 2019.
mindSpark Learning — Colorado — commits to expand computer science education creating K-12 pathways by providing professional learning programs to 32 high, 96 middle, and 500 elementary school teachers, and continuing to seek foundation grants to promote K-12 pathways providing elementary robotics kits and supporting PD. Mississippi State University — Mississippi — pledges to prepare 96 teachers to teach CS Discoveries and 32 teachers to teach CS Principles in 2019. Mouse — New York — pledges to prepare 40 teachers to teach CS Discoveries and 35 teachers to teach CS Principles in 2019. New Bohemian Innovation Collaborative — Iowa — pledges to prepare 32 teachers to teach CS Discoveries and 24 teachers to teach CS Principles in 2019. Nextech — Indiana — pledges to prepare 64 teachers to teach CS Discoveries and 50 teachers to teach CS Principles in 2019. Northeast Washington Educational Service District 101 — Washington — pledges to prepare 60 teachers to teach CS Discoveries and 60 teachers to teach CS Principles in 2019. Oklahoma Public School Resource Center (OPSRC) — Oklahoma — pledges to prepare 32 teachers to teach CS Discoveries and 32 teachers to teach CS Principles in 2019. Orlando Science Center — Florida — pledges to prepare 24 teachers to teach CS Discoveries and 24 teachers to teach CS Principles in 2019. Puget Sound Educational Service District — Washington — pledges to prepare 25 teachers to teach CS Discoveries and 20 teachers to teach CS Principles in 2019. Rice University — Texas — pledges to prepare 24 teachers to teach CS Discoveries and 24 teachers to teach CS Principles in 2019. Rice University School Mathematics Project — Texas — pledges to offer professional development opportunities for K-12 educators in each of the school districts in the greater Houston area. Riverside County Office of Education — California — pledges to prepare 28 teachers to teach CS Discoveries and 20 teachers to teach CS Principles in 2019. Sacramento County Office of Education — California — pledges to prepare 24 teachers to teach CS Discoveries and 24 teachers to teach CS Principles in 2019. Sacred Heart University — Connecticut — pledges to prepare 24 teachers to teach CS Discoveries and 20 teachers to teach CS Principles in 2019. Science City at Union Station — Missouri — pledges to prepare 55 teachers to teach CS Discoveries and 55 teachers to teach CS Principles in 2019. Silicon Valley Education Foundation — California — pledges to prepare 25 teachers to teach CS Discoveries and 17 teachers to teach CS Principles in 2019. Southern Nevada Regional Professional Development Program — Nevada — pledges to prepare 25 teachers to teach CS Discoveries and 20 teachers to teach CS Principles in 2019. STEMworks — Hawaii — pledges to prepare 45 teachers to teach CS Discoveries and 16 teachers to teach CS Principles in 2019. Tampa Bay STEM Network — Florida — pledges to prepare 50 teachers to teach CS Discoveries and 40 teachers to teach CS Principles in 2019. TCNJ Center for Excellence in STEM Education — New Jersey — pledges to prepare 54 teachers to teach CS Discoveries and 27 teachers to teach CS Principles in 2019. Technolochicas pledges to leverage its newly redesigned website to feature relatable Latina role models in technology fields who use the power of innovation to change the world. Technology & Innovation in Education — South Dakota, North Dakota, Wyoming — pledges to prepare 96 teachers to teach CS Discoveries and 72 teachers to teach CS Principles in 2019. Tennessee Department of Education — Tennessee — pledges to prepare 48 teachers to teach CS Discoveries and 48 teachers to teach CS Principles in 2019. The Friday Institute — North Carolina — pledges to prepare 160 teachers to teach CS Discoveries and 48 teachers to teach CS Principles in 2019. The Micro:bit Educational Foundation — Virginia — is working with CodeVA to bring physical computing to rural areas in south and southwest Virginia by training 100 teachers from more than 20 schools, impacting an estimated 7,000 students by spring 2020. The STEM Center of Excellence at the Citadel — South Carolina — pledges to prepare 64 teachers to teach CS Discoveries and 64 teachers to teach CS Principles in 2019. Twin Cities Public Television — Minnesota — pledges to prepare 32 teachers to teach CS Discoveries and 24 teachers to teach CS Principles in 2019. UNH STEM Teachers’ Collaborative — New Hampshire — pledges to prepare 32 teachers to teach CS Discoveries and 16 teachers to teach CS Principles in 2019. University of Nebraska — Nebraska — pledges to prepare 32 teachers to teach CS Discoveries and 25 teachers to teach CS Principles in 2019. University of Rhode Island — Rhode Island — pledges to prepare 32 teachers to teach CS Discoveries and 32 teachers to teach CS Principles in 2019. University of Texas at Dallas — Texas — pledges to prepare 60 teachers to teach CS Discoveries and 30 teachers to teach CS Principles in 2019. USC Viterbi VAST — California — pledges to prepare 32 teachers to teach CS Discoveries and 31 teachers to teach CS Principles in 2019. Utah STEM Action Center — Utah — pledges to prepare 52 teachers to teach CS Discoveries and 24 teachers to teach CS Principles in 2019. Vermont Computer Science Alliance — Vermont — pledges to prepare 20 teachers to teach CS Discoveries and 20 teachers to teach CS Principles in 2019. West Shore ESD — Michigan — pledges to prepare 100 teachers to teach CS Discoveries and 100 teachers to teach CS Principles in 2019. West Virginia University — West Virginia — pledges to prepare 64 teachers to teach CS Discoveries and 48 teachers to teach CS Principles in 2019. WNY STEM Hub — New York — pledges to prepare 32 teachers to teach CS Discoveries and 48 teachers to teach CS Principles in 2019. Adams 12 Five Star Schools — Thornton, CO — is expanding computer science opportunities for students at every level: elementary, middle and high. They are currently developing curriculum for the 6th grade CS course that will become part of their K-12 CS Pathway, and plan to begin to develop 5th grade CS course curriculum in 2019. At the high school level, they are creating a Senior CS Project course that will serve as the capstone course in the K-12 CS pathway. Additionally, they will be expanding AP CS Principles and AP CS A course availability at their comprehensive high schools and are developing a CS Robotics Club Kit with robots and curriculum to support elementary teachers implementing coding clubs. Alaska Gateway School District — Tok, AK — pledges to provide opportunities for professional development and ongoing support for teachers, implementation of additional CS courses into its schedules, and active promotion and recruitment to increase the number of female students enrolled in CS courses. The district pledges to implement CS Foundations and CS Principals in the largest school’s middle and high school schedules by 2019–20, and into the second-largest school’s middle and high school schedules by 2020–21. Aldine Independent School District — Houston, TX — is committed to ensuring that computer science is taught in every middle school in the district. Arapaho-Butler School District — Arapaho, OK — will work with the Oklahoma Public School Resource Center and Code.org to develop a full K-12 computer science pathway for its students beginning in the 2019–2020 school year. Atlanta Public Schools — Atlanta, GA — pledges to support the implementation of Information Technology/Computer Science courses to inner-city students in Atlanta, of which over 50 percent represent low-income, underserved populations. Avon Central Schools — Avon, NY — is launching a brand new K-6 STEAM Club with a focus on computer science to broaden the opportunities provided to students. Baldwin-Whitehall School District — Pittsburgh, PA — pledges to offer opportunities for all of its students in grades K-12 in all five schools to learn computer science. Every student will have an opportunity to experience in-depth and hands-on computer science coursework. Berkeley County School District — Moncks Corner, SC — is implementing CS Discoveries curriculum for credit in 2018–2019 for 11 of their 13 middle schools, impacting 1,725 students. The district has also implemented AP Computer Science Principles in two high schools and the TEALS program in one high school to continue expanding their computer science education offerings, impacting more than 100 students. Broward County Public Schools — Fort Lauderdale, FL — pledges that the district’s #BrowardCODES initiative will expand opportunities for all through an added focus on Exceptional Student Education (ESE) inclusion in computer science. BCPS will focus attention to assure all 35,000 ESE students have equitable opportunities by empowering teachers with curriculum and pedagogy to facilitate moments of success. Buffalo City School District — Buffalo, NY — began implementing CS Principles this year and is working to expand CS Principles to other district schools via a distance learning technology initiative under a collaboration agreement with College Board. Canutillo Independent School District — Canutillo, TX — pledges to develop a logical pathway for students to follow and add Dual Credit computer science to its schools’ offerings by Fall 2019. Cedar Rapids Community School District — Cedar Rapids, IA — pledges to engage its Future Ready Librarians, Digital Literacy Trainers, and Computer Science instructors in professional development through attendance at ITEC. The district also pledges to review and implement the District Technology Plan including K-12 digital literacy standards, K-12 computer science standards, and ongoing work to develop a 1:1 learning environment for middle and high school in 2019–20 and 2020–21. Chicago Public Schools — Chicago, IL — With a graduation requirement in computer science firmly in place for all Chicago public high school students, Chicago Public Schools is now working to develop solid CS pathways for K-8 students and teachers. In 2019, CSforALL and Chicago Public Schools will add training and support for at least 30 elementary schools who have not yet implemented CS curricula. This brings the total number of schools implementing CS curricula in Chicago to well over 250! Clovis Unified School District — Clovis, CA — Currently, six out of 10 secondary schools in the Clovis Unified School District have a Computer Science Discoveries or Computer Science Principles class. The district pledges that all 10 secondary schools will provide a CSD or CSP class. Cumberland County Schools — Fayetteville, NC — pledges to bring high quality computer science curriculum and career pathways to students in middle school through high school. Delta/Greely School District — Delta Junction, AK — is committed to implementing CS Discoveries and CS Principles courses in the 2019–20 school year. Detroit Public Schools Community District — Detroit, MI — is pledging to have computer science in 100% of high schools by 2019, and all grade 3-5 classrooms by 2021. Douglas Middle School — Box Elder, SD — will work with Technology & Innovation in Education (TIE) to implement CS curriculum and expand CS offerings across the curriculum during the 2018–19 school year to reach 275 students. Duquesne City School District — Duquesne, PA — pledges to bring computer science to grades 4-6 by the end of the 2018–19 academic school year. Fall Mountain School District — Langdon, NH — will work with the University of New Hampshire to expand CS curriculum from one middle school to all three middle schools in the district during the 2018–19 school year. The district also plans to expand the Extended Learning Opportunities at the high school level to double the number of students exposed to computer science. Fort Wayne Community Schools — Fort Wayne, IN — For the 2018–19 school year, Fort Wayne Community Schools is committed to teach coding to 100% of 3rd-6th grade students using Code.org as the foundation. Fremont County School District 6 — Pavillion, WY — Wind River Elementary, Middle, and High Schools in Fremont County School District 6 will implement computer science K-12. Garnet Valley School District — Glen Mills, PA — By the end of the 2018–19 school year, Garnet Valley School District will complete a comprehensive strategic plan that includes a mission and vision, as well as a draft of a K-12 Scope and Sequence of Skills and Content aligned to the PA Comp Science Standards. Furthermore, Garnet Valley will continue to support teacher leaders who have been trained and will be trained in their efforts to embed computer science standards into our current students’ learning experiences. Garvey School District — Rosemead, CA — will work with Code.org to implement a new CS curriculum in its middle schools during the 2018–19 school year. Grand Island Public School District — Grand, Island, NE — By December 1st of 2019, Grand Island Public School District will develop a strategy to bring computer science opportunities to every school in their district (14 elementary schools, three middle schools, and one high school). Staff training will follow in the next three years, and delivery of the program will be implemented in the next three to five years. Guilford County Schools — Greensboro, NC — By the end of the 2019–20 school year, Guilford County Schools pledges to provide learning opportunities for computer science to all 68 district elementary schools, all 22 district middle schools and all 28 district high schools through computer science-focused courses, special programs and partnerships, or virtual learning. Hancock County Schools — New Cumberland, WV — pledges that, beginning in January 2019, all students at Weir High school will learn Coding, App and Game Design. In addition, students at Weir Middle School will incorporate the use of new Sphero equipment to learn coding and students at Oak Glen Middle School will learn Computer Science Discoveries in 6th grade. Hawthorne School District — Hawthorne, CA — The Hawthorne School District pledges to implement computer science classes at Bud Carson Middle School. A course will be offered for the first time during the 2019–20 school year. This course will be implemented as the initial phase of developing a middle school computer science pathway. HSD believes it is important to develop a computer science pathway to further support the district’s initiative of providing students a broad course of study. The partnership with USC Viterbi and Code.org will enhance the district mission to maximize each student’s potential to achieve educational excellence. Hays CISD — Kyle, TX — has implemented computer science in six middle schools and two high schools and pledges to expand to a third high school in August. Kauai School District — Hawaii — pledges to introduce interested elementary, middle, and high school principals and their faculties to the Hawaii Board of Education-approved CSTA standards by June 2020. In addition, the district plans to support elementary and middle schools in their efforts to become trained in Code.org Fundamentals and Discoveries curriculum by June 2020. LeBlanc Middle School — Sulphur, LA — pledges to work with McNeese University to implement a new computer science curriculum in its STEM classes as a model for other schools in the parish to follow. Lewiston Public Schools — Lewiston, ME — By June 2019, Lewiston Public Schools aims to provide 50% of Lewiston students with a coding experience by integrating coding into the school day and offering activities outside the school day in each of our eight schools. Limestone County Schools — Athens, AL — pledges to offer CS Discoveries through Code.org in at least two additional middle schools next school year. Littleton Public Schools — Littleton, CO — is committed to initiating computer science and instructional activities at its four middle schools and alternative high school during the 2019–20 school year. This represents 90% of the district’s secondary students, or approximately 7,000 students. Logan County — Logan County, WV — pledges to work with all 11 elementary schools, three middle schools, and three high schools throughout the 2018–19 school year to provide support for the development of action steps to implement computer science courses in the fall of 2019. Lone Tree School District — Lone Tree, IA — pledges to bring computer science to its middle school for the first time. Manatee School District — Bradenton, FL — pledges to bring onsite computer science to all middle schools in Manatee County. Manchester School District — Manchester, NH — pledges to expand computer science curriculum offerings to include all four middle schools (grades 6–8), all four high schools, and at least seven of 14 elementary schools. Matanuska-Susitna Borough School District — Palmer, AK — pledges to create a district-wide, rigorous, and ongoing professional development plan, with at least a quarter of all CS teachers trained within a year. Millwood Public Schools — Oklahoma City, OK — will work with the Oklahoma Public School Resource Center and Code.org to develop a full K-12 computer science pathway for students, with initial implementation work beginning in the 2019–20 school year. Mountain Home School District — Mountain Home, ID — will implement Code.org curriculum at Mountain Home High School, Mountain Home Junior High School, and Bennett Mountain High School. New York City Department of Education — New York, NY — through the Computer Science for All initiative, the NYC Department of Education is committed to providing every NYC public school student (~1.1 million) in grades K-12 with a meaningful computer science education by 2025. Northern Nevada Regional Professional Development Program — Elko, NV — In conjunction with the Southern Nevada Regional Professional Development Program (SNRPDP), the Northern Nevada Regional Professional Development Program (NNRPDP) is working with six northern districts across 51,000 squares miles in northeastern Nevada to provide educators in the region the opportunity to implement the Code.org curriculum in their respective districts. Code.org curriculum courses are being offered to K-12 educators in each of the six counties, ensuring that the teachers of the rural students in these areas have access to a quality computer science curriculum. Osage Community School District — Osage, IA — had all elementary teachers trained in CS Fundamentals with Code.org last year and, moving forward, will continue to work on integrating CS into all curricular areas subjects. The district is also entering its second year of requiring a computer science exploratory course for grades 6-8, and now requires all high school students to take at least one semester of CS during freshman year. In addition, Osage Community Schools added game design and independent study to its current CS offerings of CS Principles and AP CS Principles, and plans to add a cybersecurity course and other CS courses based on the interest of students. Pecos-Barstow-Toyah Independent School District — Pecos, TX — pledges to increase students’ knowledge and access to computer science programs by using engaging teaching methods and individualized learning across all five campuses in the district. Perris Union High School District — Perris, CA — pledges to add 13 sections of computer science classes district-wide. Pickens County School District — Easley, SC — is building upon its commitment to provide computer science education with a new implementation of the Computer Science Discoveries curriculum in all four high schools and all five middle schools, positively impacting more than 4,000 students at the secondary level during the 2019–20 school year. Pinellas County Schools — Largo, FL — pledges to bring computer science to 17 high schools and 23 middle schools by January 2019. Platte County School District #2 — Guernsey, WY — pledges to maintain its commitment to the education of its students from kindergarten to 12th grade in the area of computer sciences. The district pledges to do its best to find time, resources and educators to continue the program and make CS a part of the everyday curriculum. The district also pledges to build a CS community between the three schools and focus on building a lasting impact for its students’ future. Postville Community School District — Postville, IA — pledges to provide professional development for K-6 teachers to help them integrate CS into their classes. The district also pledges to add Computer Science Explorations for 7th and 8th grade students and add a computer science elective for high school students. Poudre School District — Fort Collins, CO — pledges to implement a cohesive K-12 curriculum pathway with expanded training and funding to teachers as well as an addition of CS counting towards some math credits for high school graduation. Pueblo City Schools — Pueblo, CO — has begun the process of bringing computer science curriculum to the district in a multi-phase implementation model. Phase I involved a close partnership with mindSpark Learning from June 2018 to June 2019 to bring CS to one-third of the schools in the district. Phase II will include bringing the CS Principles to two high schools, two additional middle schools and six additional elementary schools. This will double participation in the district, increasing the percentage of participating schools to two-thirds of the district. Raleigh County Schools — Beckley, WV — pledges to bring computer science to all 27 schools in Raleigh County by 2020. Remsen St. Mary’s Schools — Remsen, IA — pledges to have all elementary school teachers (K-5) attend professional development on the Code.org Computer Science Fundamentals curriculum in order to integrate computer science into classrooms for all students. Remsen St. Mary’s Schools also pledges to require all middle school students to take the new Computer Science Exploratory Course during 5th-8th grades. In addition, Remsen St. Mary’s Schools will investigate the possibility of offering the Code.org Computer Science Discoveries curriculum for freshmen and sophomores in high school. Remsen St. Mary’s Schools offers a Computer Science Principles AP course for juniors and seniors in high school, and will continue to offer this course for the 2019–20 school year. Riverdale Joint Unified School District — Riverdale, CA — is a rural district in Fresno County expanding opportunities for students by introducing computer science at all school sites for grades 2-11. The district is offering CS Fundamentals for grades 2–6, CS Discoveries for grades 7–8 and AP CS Principles for grades 9–12. Roland-Story Community School District — Story City, IA — starting in the 2019–20 school year, Roland-Story CSD pledges to provide professional development for K-12 staff to integrate computer science, as appropriate, for all students; incorporate more, and more in-depth, computer science/literacy into existing 7-8 exploratories; expand coding opportunities at the elementary level; and offer introductory computer science course at the high school. RSU 29 — Houlton, ME — pledges to expand computer science to all three schools in the district by 2021. School District 49 — Peyton, CO — pledges to create a pathway for all teachers, students and parents of students in grades K-12 to have access to and learn more about computer science. This plan will include a pathway from five elementary schools, to its middle schools, to the high school. Sergeant Bluff-Luton School District — Sergeant Bluff, IA — pledges to offer the opportunity to all middle school students to take an introductory computer science course in the 8th grade, starting in the 2019–20 school year. Additionally, Sergeant Bluff-Luton will continue to offer the introductory course as an elective in the high school and will also expand their course offerings by offering additional computer science courses for students in the high school. Sheffield City — Sheffield, AL — pledges to increase district enrollment in computer science by 50% by adding AP Computer Science A and Exploring Computer Science to its curriculum offerings. Shelby Public Schools — Shelby, MI — At Shelby Public Schools, all elementary students will be receiving computer science instruction and the high school will offer an AP computer science class for the first time in 2018–19. Shoreline School District — Shoreline, WA — was awarded $55,438 from OSPI for professional development to build a K-12 computer science pathway. This is a team effort between CTE, Equity, Instruction, and IT leadership that is an equity-focused designed professional learning targeting gaps in professional development experiences. Representative teams learn about equity issues as they design feasible implementation plans for equitable computer science. 75 elementary teachers will receive one-day of Code.org training in the 2018–19 school year. In middle school, seven days of professional development will be provided during the same time period for six staff members to learn and develop implementation models. Each teacher trained in Code.org this school year is committed to going through a Fundamental Course with their students. Soda Springs Joint School District #150 — Soda Springs, ID — pledges to bring computer science to the three schools in the district. They have started the process at Tigert Middle School and plan to provide the elementary and high school students CS opportunities as soon as possible. Soledad Unified School District — Soledad, CA — will be bringing the computer science class to its middle school for the first time for about 180 students next year. Southern Huntingdon County School District — Three Springs, PA — Southern Huntingdon County SD, a small rural district with one high school, one middle school and three elementary schools, is offering Computer Science Discoveries for the first time for one class period per day during the 2018–19 school year. For the next school year, the district pledges to expand the offering to multiple class periods and also add AP Computer Science Principles. The district is also planning to offer the CS Fundamentals Express program to multiple grades in its middle school. To extend the reach into the elementary schools, the district plan to participate in Hour of Code and offer a CS Club in conjunction with the local community library. Southern York County School District — Glen Rock, PA — will work with Code.org to pilot and implement a new CS curriculum in all three K-6 schools, reaching more than 1,400 students in Glen Rock during the 2018–19 school year. South Kingstown School District — Wakefield, RI — South Kingstown School District just trained all of its grade 2 teachers with Code.org Fundamentals so that every second grade student in the district has access to computer science. The district is also adding Code.org Discoveries to its middle school this school year, and expanding computer science at its high school due to interest in the Code.org introductory course and AP Computer Science A electives. Spearfish School District — Spearfish, SD — will increase the number of teachers teaching CS discoveries in the middle school from one to two. In the elementary school, teachers will be offered the CS Fundamentals workshop in the spring of 2019. The middle school also will provide family awareness nights with the Family Code Night curriculum. Spring Independent School District — Houston, TX — will work with Rice University to implement a new CS curriculum in K-5 schools in Houston, Texas during the 2019–20 school year. St. John and Endicott School Districts — St. John, WA and Endicott, WA — will expand computer science education opportunities to all district schools by 2020. St. Johns County School District — St. Augustine, FL — pledges to expand computer science education to all seven high schools in the district, as well as continue the work that began last school year by implementing CS in the remaining middle schools — bringing CS to all 21 middle and high schools in the district. The district also pledges to continue to build opportunities for partnerships in coding, particularly with CS Fundamentals, and plans to create a “showcase” elementary in which every single teacher in the elementary school will be trained with CS Fundamentals. Sterling 35 School District — Sterling, ND — pledges to work with five area schools to get computer science programs started in their rural areas. Teton County School District — Jackson, WY — has started offering computer science to all students in grades 6-7 and pledges to expand its efforts to make a full year of programming available to all students. The district plans to continue to look for time in the school year to offer additional CS to all middle school students, hold two parent outreach events, and start a coding club at the middle school. The Park School of Buffalo — Buffalo, NY — pledges to bring CS to all grades K-12. Warner School District — Warner, SD — For the 2019–20 school year, Warner School District pledges to expand CS courses in the high and middle schools, including offering AP Computer Science A in the high school. The district also pledges to expand extracurricular CS opportunities in order to encourage student interest and participation in CS classes. Wattsburg Area School District — Erie, PA — pledges to immerse elementary school students in the Code.org curriculum, and use Computer Science Discoveries in grades 6-8. In addition, the 7th grade science teacher will continue to utilize Lego Education and run the Jr. Robotics club. Seneca High School added several new courses this year: Code.org — AP Computer Science Principles; Codehs.com — Software Development [Python]; Codehs.com — Website Development [CSS/HTML] — and plans to add more sections of AP Computer Science Principles. Waukegan Public Schools — Waukegan, IL — pledges to implement Code.org curricula in 20 schools during the 2018–19 school year. Wellsville Central School District — Wellsville, NY — pledges to expand CS in their secondary school by adding a new course, and implement CS in their elementary school. They are committed to establishing a full CS pathway, encompassing CS Fundamentals, CS Discoveries and CS Principles, in their district. Widefield School District 3 — Colorado Springs, CO — pledges to use Code.org curriculum to expand the computer science offerings across the district over the next two years. In August 2019, the district is opening a 900-student K-8 school that is entirely computer science-focused. It is one of the few schools in the nation with this design and focus. Code.org Fundamentals and Discoveries will be implemented as a component of the integrated curriculum, with well over the required thirty hours of computer science education delivered for students across the year. 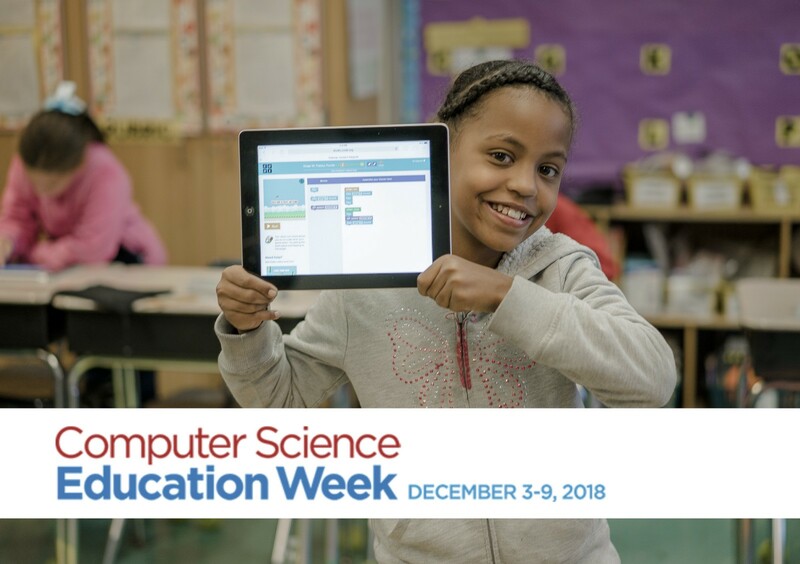 Additionally, teachers from all of the elementary schools will be trained in Computer Science Fundamentals this year to support their use of the curriculum materials in class projects, in STEM specials, and throughout the Hour of Code week. The district also pledges to train two junior high school teachers this summer with Computer Science Discoveries. Woonsocket Education Department — Woonsocket, RI — added 25 computer science classes to the middle schools, which ensured both schools in the district are fully implemented in grades 6-8. Two new CS classes have also been added at the high school level. Next year, the district pledges to implement Code.org curriculum in the elementary school during library time. Xavier Catholic Schools — Cedar Rapids, IA — pledges to expand CS offerings in all elementary schools for all grades. Yukon-Koyukuk School District — Fairbanks, AK — pledges to work with the Alaska Staff Development Network to implement a new computer science curriculum in all 10 village schools, covering 65,000 square miles of area in the interior of Alaska. AK Grad will coordinate efforts with the district’s Raven Homeschool program to offer CS courses for the 2019–20 school year. In addition, CS Discoveries and CS Principles will be offered in all middle and high schools around the district in the 2019–20 school year. Accenture Slovakia — Slovakia — Accenture in Slovakia, in partnership with other tech companies, pledges to organize trainings in 40 cities all over the country, equipping 400 teachers with knowledge to be able to teach Code.org’s CS Fundamentals course. This is in addition to the 341 teachers who have already been trained within the last three years. Aksorn Education — Thailand — Aksorn Education pledges to prepare at least 100 teachers to teach CS and teach at least 1,000 students to code in 2019. Australian Computing Academy and Grok Learning — Australia — In collaboration with the University of Sydney, the Australia and New Zealand Banking Group, the Commonwealth Bank of Australia, the National Australia Bank, the Westpac Banking Corporation, and British Telecom, the Australian Computing Academy and Grok Learning pledge to teach tens of thousands of Australian high school students critical cybersecurity skills through a program launching in 2018. Balanga Makerspace — Philippines — Balanga Makerspace pledges to partner with JCI Bataan, the city government of Balanga, and the Balanga Department of Education to train 30 teachers and teach at least 1,000 students how to code. They will also continue to provide learning opportunities for computer science in local schools with the help of their partners at JCI Bataan and the Bataan ICT Development Council. Code for Change — South Africa — Code for Change pledges to bring 40 new secondary schools into their program and get 10,000 youth coding both on and offline throughout the country. They will also run a media campaign to raise awareness about CSEdWeek in South Africa and will host events and roadshows throughout Johannesburg. Crack the Code — Peru — Crack The Code pledges to reach more than 1,000 students in 2019, organize at least four Hour of Code events, and grant a minimum of five full-year scholarships to exceptional students from different backgrounds. They will also launch professional development courses for teachers and hope to reach at least 20 teachers in 2019. Cuantrix and Fundación Televisa — México — Cuantrix and Fundación Televisa pledge to reach 1,000 teachers and empower them to teach computer science and programming to their students. Their goal is to reach 80,000 students throughout Mexico in 2019. Additionally, Cuantrix has been accepted by the Ministry of Education to be part of their national online educational portal. This allows any public school in Mexico to choose to teach Cuantrix for free. Czechitas — Czech Republic — Czechitas pledges to reach at least 200 ICT teachers and at least 1,000 students in schools in 2019. They currently work with a group of 20 teachers who help inspire other teachers and they plan to grow this network to at least 50 teachers. Ghana Code Club — Ghana — Ghana Code Club pledges to partner with the Ghana Investment Fund for Electronic Communications (GIFEC) to train 300 teachers in addition to the 150 teachers already trained to teach coding to junior high students. GIFEC has established 291 community information centers and each center will empower 150 children reaching a total of 43,650 elementary students throughout the country. Hora del Código — Paraguay — The organizers of the Hour of Code in Paraguay pledge to work with the Ministry of Education and other partners to reach 100 schools throughout 2019 to inspire teachers and students to learn computer science. Institute for Innovative Learning at Mahidol University — Thailand — With funding from Aksorn Education, the Institute for Innovative Learning at Mahidol University pledges to prepare 100 teachers on Code.org’s CS Fundamentals curriculum and 100 teachers on Code.org’s CS Discoveries curriculum by the end of 2019. Kids Code Jeunesse — Canada — With funding from the Canadian government’s CanCode program, Kids Code Jeunesse pledges to integrate code and computational thinking in classrooms in every province, reaching over 2,000 teachers and over 40,000 students before April 2019. Additionally, Code Club — powered by Kids Code Jeunesse in Canada — pledges to help every community in Canada start a club and offer their community digital skills opportunities in a sustainable and meaningful way. Kodea — Chile — In 2018, Kodea began a pilot to bring Code.org to 50 schools in the metropolitan region. Kodea pledges to develop a network of partners in 2019 that will be able to train schools across the entire country. Korea Foundation for the Advancement of Science and Creativity (KOFAC) — South Korea — KOFAC pledges to expand teacher training programs in 2019 to enhance the quality of software education teachers and continue to support teachers’ college students in South Korea in order to cultivate qualified teachers in the field. With funding from the Ministry of Education and the Ministry of Science and ICT, KOFAC will continue to support software education for selected elementary and secondary schools. Microsoft Vietnam — Vietnam — Microsoft Vietnam pledges to work with the Ministry of Education and Training, Vietnet ICT, and the Dariu Foundation to implement a new CS curriculum in selected schools across 15 provinces, reaching 200,000 youths during the 2018–19 school year. Ministry of Education, Culture, Science, and Technology — Argentina — In 2018, Argentina became the first country in South America to integrate programming and robotics into compulsory education. In 2019, the Ministry of Education, Culture, Science, and Technology pledges to deliver resources and training to support teachers and students as they make these adjustments. They will also focus on special nationwide events such as the National Marathon in Programming and Robotics. Mozilla Indore — India — In 2019, Mozilla Indore pledges to reach 20 schools, through which they will teach more than 5,000 students how to write their first lines of code. They will also continue to provide computer science pathways at both of their comprehensive high schools. Mpumalanga ICT CLUB — South Africa — Mpumalanga ICT CLUB pledges to attract more girls into CS education by hosting weekend and holiday coding events. They plan to host an Hour of Code event with 60 girls at Sofunda Secondary School to officially open their new computer lab and establish a coding club at the school. Odyssey Educational Foundation — Nigeria — Odyssey Educational Foundation pledges to reach 500 teachers and 4,000 students in 2019. While focusing on the inclusion of females and underserved children, they plan to introduce students to computer science and help transition Nigeria to a knowledge-based economy. Program.AR — Argentina — Program.AR is working to train 800 teachers in CS courses at 20 different universities. They pledge to continue to train even more teachers and encourage them all to hold Hour of Code events at their schools. Programma il Futuro — Italy — Programma il Futuro — an initiative managed by CINI, the Italian University Consortium for Informatics, and in cooperation with MIUR, the Italian Ministry of Education, University, and Research — pledges to develop CS education initiatives in more than 80% of Italian schools during the 2018-19 school year. This work is possible because of funding from Engineering, TIM, De Agostini Scuola, SeeWeb and special agreements with Confindustria Digitale and Confartigianato. Q-STEAM Code Club — Egypt — Q-STEAM Code Club pledges to prepare 100 teachers to teach CS in 2019. They will also help 200 primary schools in Egypt to participate in the Hour of Code in 2018 by providing free professional development workshops and classroom resources. They will reach even more students through weekly code clubs. Siamentis — Thailand — During CSEdWeek, Siamentis pledges to hold Hour of Code events reaching approximately 1,000 middle school students in seven schools. These schools are located in all regions of Thailand and for most of these students, this will be their first introduction to coding and computational thinking. UP System Information Technology Foundation (UPSITF) — Philippines — UPSITF pledges to continue implementing professional development workshops for educators and offering technology boot camps for students. They’ll also continue reaching out to K-12 schools and exposing them to the opportunities of coding and computer science while working with partners (academic, industry, and government) to promote information technology and computer science across the country. Women Who Code Taipei — Taiwan — Women Who Code Taipei pledges to partner with Ladies that UX, Dell Taiwan, and other organizations to prepare 100 women to teach Code.org’s CS Fundamentals, CS Discoveries, and CS Principles courses and help expand access for girls to learn computer science in 2019.